During the past five years, we’ve been using budget travel tactics to cruise entirely around the world. So during all this time as passengers on cruise ships, we’ve been figuring out ways to keep our bar bill extremely low while on cruise ships. As such, we’ve developed a variety of alcohol hacks and tips on how to get cheap drinks on a cruise. For example, during a 14-day sailing on the Celebrity Eclipse, we managed to keep our bar tab under $75 per person. That’s less than $6 per day and we still drank quite well …and a lot! 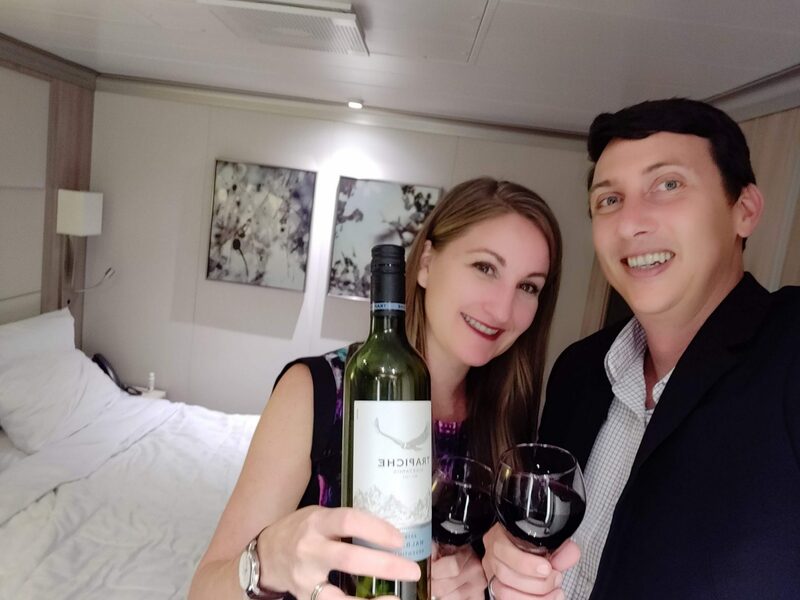 During a transatlantic repositioning cruise on Royal Caribbean’s Liberty of the Seas, we solely used our $100 onboard credit to drink throughout the cruise and we again drank very well during the 13-day voyage. Meanwhile during a recent cruise, sailing on the brand new NCL Bliss, we didn’t drop a dime on alcohol and still drank heavily most nights. 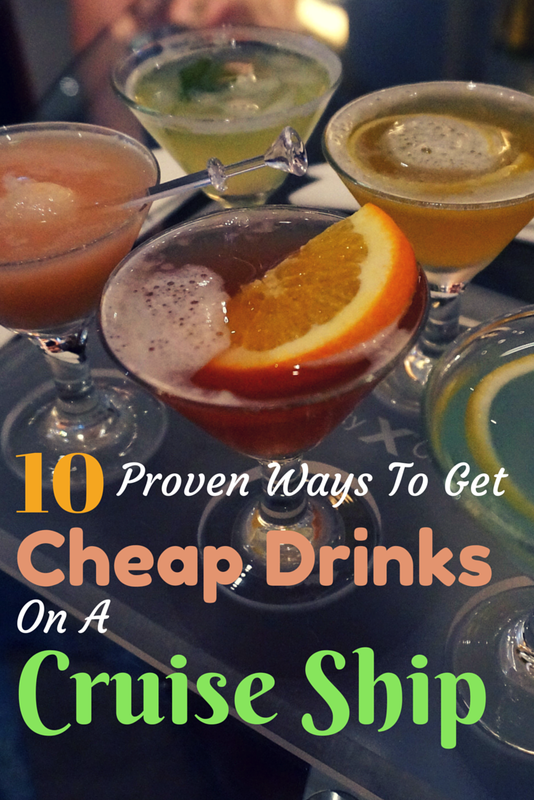 We’ll now divulge our best cheap drinks tips on a cruise! Without further ado, here are 10 cruise tips & tricks for getting cheap alcohol while at sea. Let the party begin! Many cruise lines offer a happy hour at certain bars, at certain times, with reduced priced drinks. Sometimes these happy hours are planned and stated in the daily newsletter. Other times they’ll be listed on the bar menus themselves. But often such drink deals are only subtly advertised. You must be observant and seek out these drink deals. Keep your eyes peeled for happy hour promotions on table-top signs. And know that cruise happy hours may even be different from bar to bar. On the Celebrity Eclipse, we found $3 draft beers and $4 wine pours at most bars during its happy hour, but this did not extend to every bar on the ship. Meanwhile, their martini bar had an entirely different happy hour with select martinis at half price. Yet the martini bar doesn’t honor the beer & wine happy hour. So be sure to check around all the bars and find a happy hour that is best for you! During a sailing on Royal Caribbean Liberty of the Seas, we noticed that most bars actually do not have a happy hour at all. But the somewhat hidden On The Air Club had BOGO margaritas, daiquiris, and long island iced teas during their late afternoon happy hour that was exclusive to that bar only. No one ever seemed to venture there from 4:00-6:00, so usually we were the only ones there sipping on strong long island iced teas that came out to only $4. Now that’s a great bang for your buck! Also, some cruises will have two happy hour periods: one before dinner and another into the late night. Celebrity Cruises does this dual happy hour, first from 4:00-6:00 and again at 10:00-midnight. 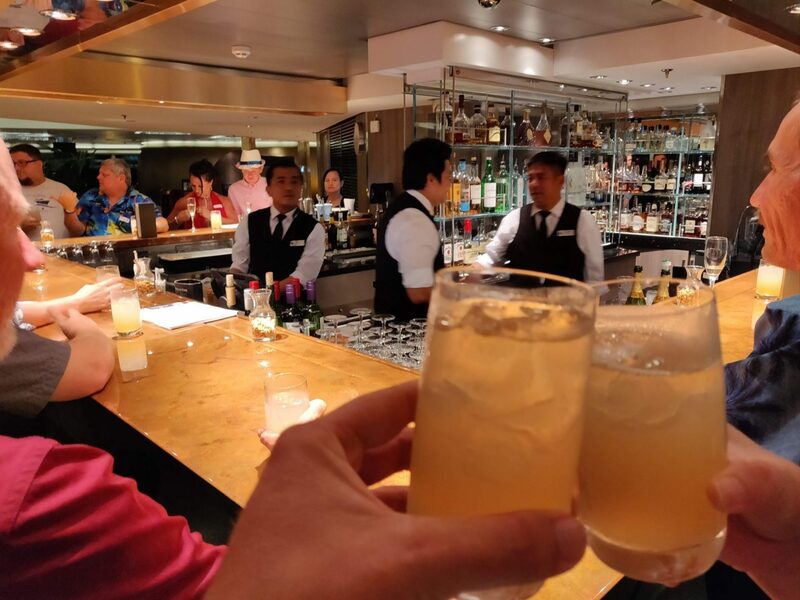 Happy hour on Holland America is similar, with their promotion usually running from 4:00-5:00 at one bar, then again from 10:00 at another, giving thrifty drinkers a cheap drink deal of buying one drink and getting a second for $2. If you can time your drinks right, you’ll be sipping on cocktails for about the same price as your local watering hole back home. Use cruise happy hours in combination with other strategies listed here during the non-happy hour periods. And while most cruise happy hours are planned, some lines such as Carnival Cruises have been known to just announce drink deals spontaneously on party nights. Listen up and you may hear the DJ announce $1 beers! It’s happened to us before when sailing with Carnival and we stocked up. If beer prices are slashed for happy hour or during a promotion, consider ordering a round of unopened beers to stock up your minifridge while prices are low. Then take them back to your cabin, only to enjoy them poolside during the following day. Occasionally a bartender will insist on opening the beer. If that’s so, go with the 16 oz. aluminum bottles with twist off caps, since those can be easily resealed. But often bartenders have no issue with passengers buying several unopened beers during a promotion. 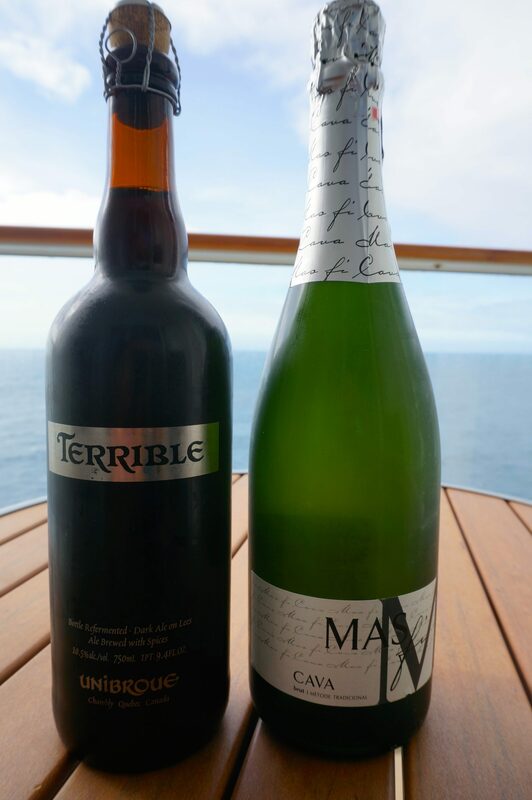 In fact, on a Holland America cruise when a 2-for-1 craft beer promotion came up, a bartender offered to send an entire case of discounted beers to our stateroom! We did. This brought the price-per-beer down to $2.98, which is even cheaper than buying those same beers at a bar on land! Wine tastings, cocktail tastings, martini tastings, and even beer tastings can be some of the best drink deals at sea. Personally, it’s our favorite tip for cheap drinks on a cruise to partake in. Specialty drinks like fine martinis typically cost $10 or more, plus gratuity. 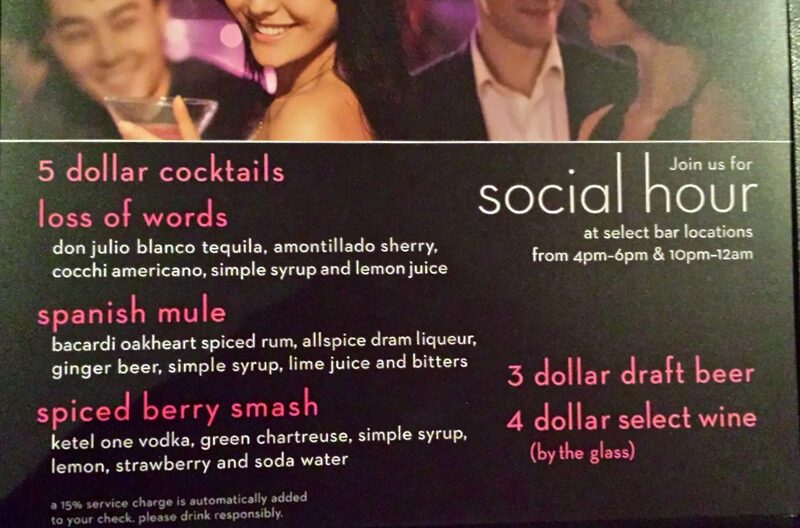 So five of such drinks would be priced at $50+. But when you attend a tasting event, you often get five full-sized drinks for $10-$25 per person. These events can be incredible booze bargains on a cruise. Plus you get to try a variety of different drinks you may have never thought to try before. During some cruise tasting events that we’ve attended, the drinks are smaller portions coming in at about 4-6 ounces. Yet other events, we’ve been pleasantly surprised by full-sized drinks! 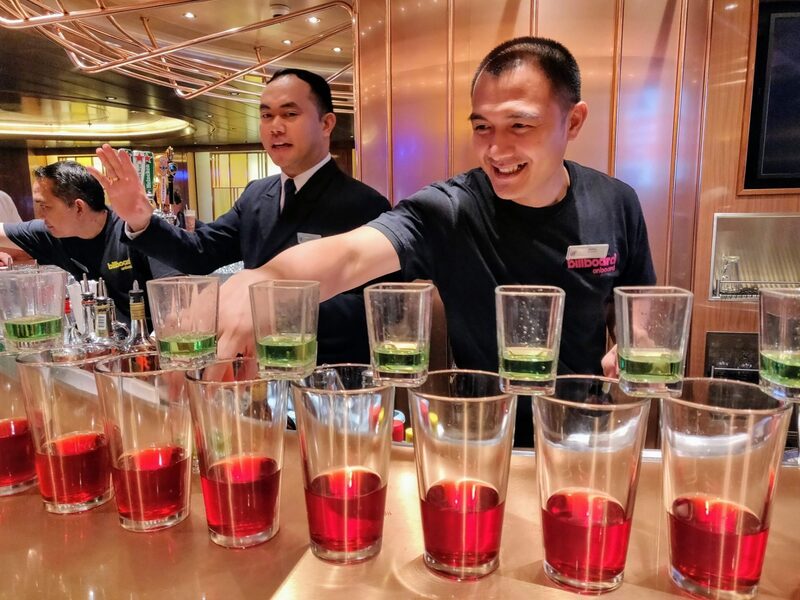 We’ve found tasting events on NCL (Norwegian Cruise Line) to be of particularly good value, as they’ve poured some large and strong drinks during their tastings. Norwegian usually does a martini tasting, margarita tasting, a beer tasting, and a wine tasting during their regular sailings. If you don’t want to drink all five drinks, consider attending with a partner/friend and sharing the experience. 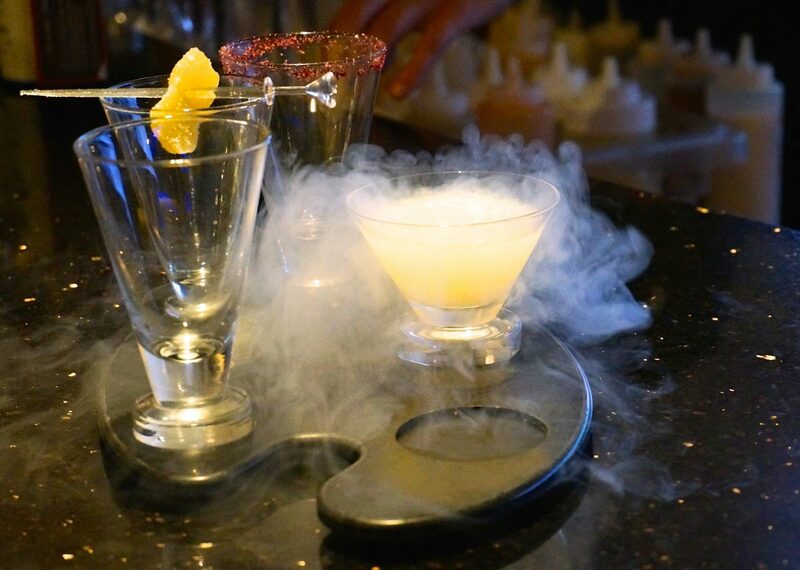 These drink tasting events are a lot of fun and a great way to make friends during a cruise. We’ve learned some drink recipes that we now use back home. Keep an eye out for such tasting events in the daily itineraries. When you see them, jump on it and you may just discover your favorite new libation, all while being mindful of your drink budget. 💡 Tip: If you ever happen to cruise on the Norwegian Bliss, be sure to go the show “Happy Hour Prohibition – The Musical”. It costs $25, but that fee includes five prohibition-era cocktails throughout the entire performance. It’s great fun and great value! Cruises want you to spend money on drinks and will reward you for your commitment to drinking more alcohol! Here are three ways to save on wine & beer, by buying in bulk. Never ever order by the glass on a cruise, even if you’re only going to have one glass of wine with dinner. Here’s why: if you order a bottle of wine and don’t finish it, your server will gladly re-cork it for you so that you can enjoy the rest of that bottle on another night, at no additional charge. Also, most cruise ships even permit the server to send what’s left of the bottle to another bar or even to your stateroom. As is the case with any land-based restaurant, wine by the bottle on cruise ships offers significant savings compared to ordering by the glass. So as long as you’re able to finish an entire bottle during the length of your entire cruise, there’s really no reason to ever order by the glass. Those $7 glasses of wine may seem like a good deal, but buying the whole bottle for $29 will ultimately get you more wine for less money. Most all cruise lines offer wine packages in which you commit to a certain number of bottles throughout your sailing, at a reduced price. Typically the more bottles you commit to, the greater the price reduction. Try to estimate how much wine you’ll go through on the front end of the cruise which will lessen the blow to your onboard account by departure day. You can often purchase these wine packages before you set sail which may provide even a little bit more of a discount. For example, Celebrity offers a Taste of the Vineyards package online with either 3, 5, or 7 bottles. The 3-bottle package starts at $109. Take a look online or ask your booking agent. Otherwise, once you’re on the ship, inquire about these wine packages at the ship’s wine bar. If you’re going on a 7-day cruise and you think you may share one bottle of wine each night for dinner, then look for an appropriate wine package to save money on your wine bill. 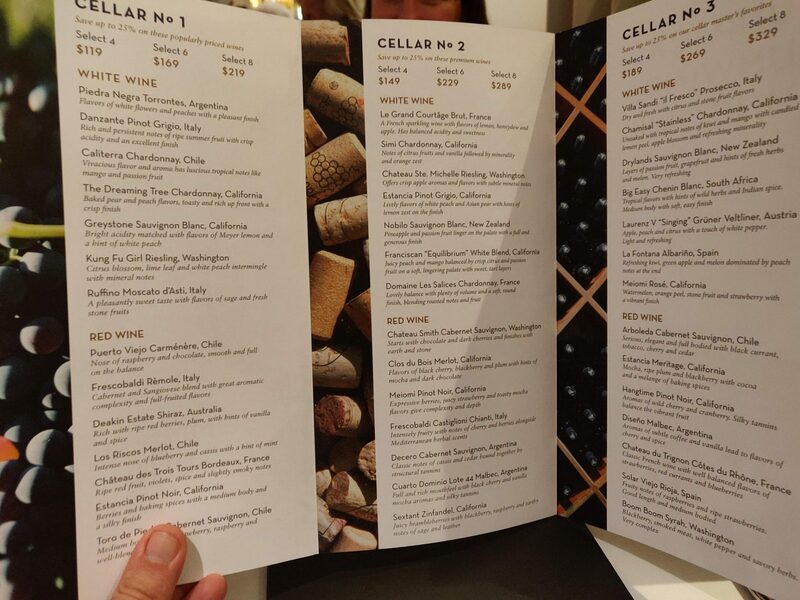 Below is an example of the Holland America wine packages we found during a recent cruise. Packages start at $119 for a four bottle package, which saves about $30 in total if you were to buy those same four bottles separately, not as part of the wine package. Are you heading to the pool and want to kick back a few beers? Buy a bucket of five beers, which most cruises usually offer for the cost of four. It’s a win-win by saving the server a few trips to deliver your beer while saving you a few bucks. Beer buckets may not be the best drink deal out on the high seas, but it still saves the $6-$7 cost of a bottle of beer. Even if you’re not planning to drink all of those beers in one sitting, it can be worth buying the bucket and bring whatever is left back to your cabin to put on ice or in the mini fridge. Many cruise lines have a specialty “drink of the day” which will usually save you $1-$3 off the regular price. An additional bonus to the daily drink specials is that you may even get a souvenir cup which can entail even further discounts when getting a refill. The drink of the day is usually outlined in the daily cruise newsletter. Waking up to find out the “daily drink” happens to be your favorite is like a Christmas morning surprise. If you have an extra hour or two to burn while in port, skip the sugary overpriced drinks at Señor Frog’s and Fat Tuesday’s. Instead, find a cozy local bar a little further away from the port to throw back a few. Not only will you have a more authentic travel experience with local flavor, but you also may find local prices! You can have your Buds, Millers, Coors, Coronas, and Heinekens once you’re back on the ship. Instead, take the opportunity on shore to explore a local beer or spirit. We’ve found there to be some surprisingly tasty brews popping up all around the world. Many popular Caribbean and Central American cruise destinations even have local brewpubs near cruise ports. Also, be aware that many places around the world don’t have open container laws like in the US. This means you can go into a local convenience store, and get a cold beer to enjoy while relaxing on the beach, touring the city streets, or simply walking back to the ship while you sip. Many countries officially do have open container laws, but they are completely unenforced in popular cruise ports. If you Google to see if open containers are allowed the ports you’re traveling to, you may find some conflicting information. The best way to know whether drinking alcohol in public is tolerated is this: if the cashier of a convenience store has a bottle opener at the counter, then it is totally acceptable to drink on the streets while in port. You may even be offered a cup! The best part is that all of these local beers while in port will be at a fraction of the cost compared to the cruise ship’s pricey drinks. But go beyond the beer while ashore. Get to know the local drinks in an area you’re visiting! Local wine found ashore throughout a Mediterranean cruise is not only delicious but can be surprisingly cheap. That’s the same for rum throughout the Caribbean. And let’s not forget about all the yummy tropical cocktails found all throughout many of the world’s most popular island cruise ports. Our favorite is painkillers in the Virgin Islands! 💡 Pro Tip: Go On Inexpensive Shore Excursions that Include All Your Alcohol! Instead of necking a bottle of beer in the streets, book a tasting tour, a booze cruise, or an all-inclusive beach pass while in port. Use a tour agency independent from the cruise line save money on shore excursions. We always use and recommend Viator shore excursions since they tend to be nearly half the cost of the cruise line’s excursions. Their ports of call tours include a worry-free guarantee promise to get you back to the ship. And if your cruise has to cancel a port for any reason, it’s nice to know that they automatically provide a full refund. Mr. Sancho’s Beach Club is the hottest drink ticket in Cozumel and is such incredible value! A mere $49 gets you an all-day pass to this white-sand beach resort that includes a full open bar with unlimited drinks! The day pass also includes a complete lunch menu, beach loungers, and even ocean kayaking! But best of all, there’s a swim-up bar, so you don’t even have to leave the pool to get your next margarita. Drink up! ⚠️ Beware: this regularly sells out in advance. Check availability now for your travel dates. Catamaran Sail & Snorkel: After snorkeling on Cozumel’s reef, you’ll be treated to cervezas, rum punch, and even tequila shots as you sail around the island. Jose Cuervo Tequila Tasting: While docked in this Mexican port, you can become a certified tequila connoisseur during a 3-tequila tasting, then learn how to make a margarita the authentic way! Rum & Food Walking Tour is our top pick for Nassau, as it includes 6 rum tastings, 2 cocktails, and more. The distillery visit is interesting and the rum produced is so good that we bought a bottle! See the latest reviews. Nassau Beer Tasting & Food Tour samples some Bahamian beer favorites and visits the country’s first craft brewery, which takes in nine beer samples in total plus great local food like conch fritters. 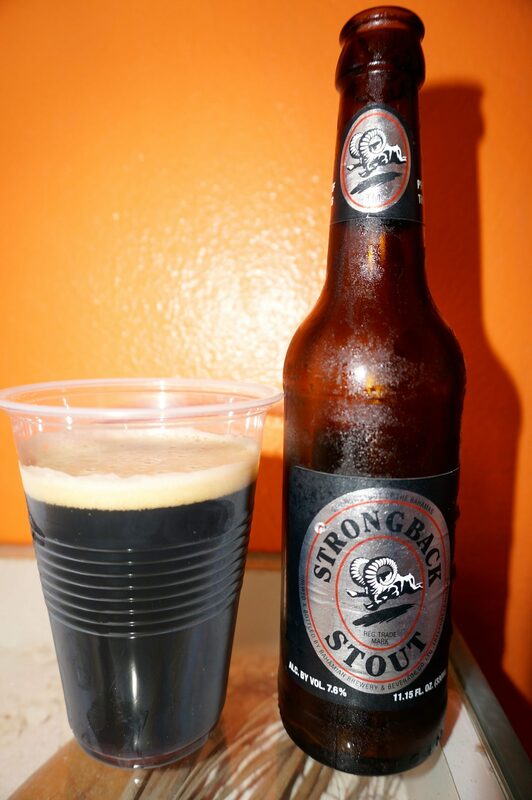 Bahamian Brewery Tour: This $29 shore excursion may be the cheapest way to drink a lot while docked in the Bahamas. Why? Because the brewery is known to leave their taps open at the end of the brewery tour until you get your fill. More info. Party Boat & Snorkel: This booze cruise in Freeport may not be cheap but it sure looks like an absolute blast and includes unlimited alcohol at the island BBQ and boat ride! Distillery & Brewery Tour Plus Beach: This is our top pick for the Cayman Islands, as this 4-hour tour packs in a distillery, rum factory, craft brewery, and even time on the famous Seven Mile beach. The tour includes loads of rum, vodka, and beer along the way and is only $37! You definitely won’t return to the ship sober. Book now. Cayman Spirits Distillery Tour: At only $22, this may be the cheapest boozy shore excursion in the world! Rum Island Tasting Tour: This four-stop tour includes a daiquiri lesson while listening to pirate tales and drinking lots of the island’s signature Cruzan rum before ending up a local pub! It’s a bargain for St Thomas too, as this shore tour is usually listed for less than $50! Check prices. 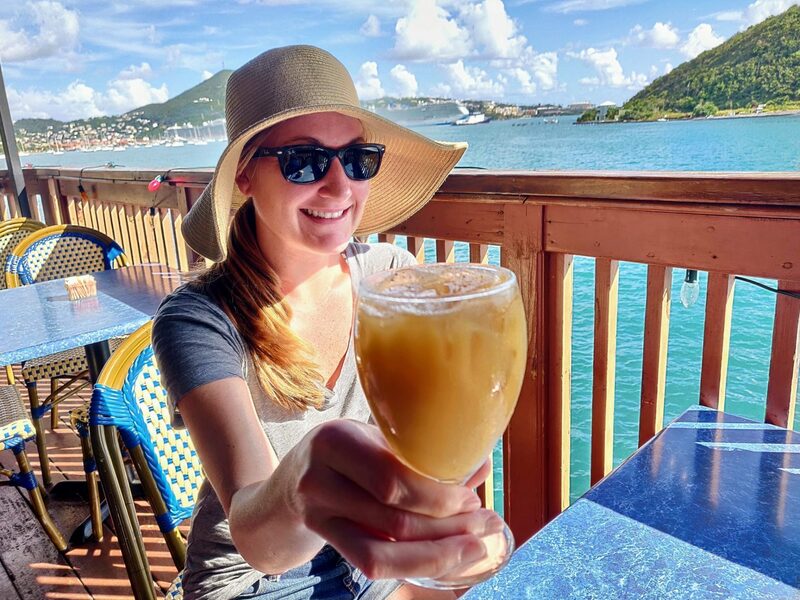 Rum & Food Tour: This tour also explores St Thomas’s rum history, as it includes two rum drinks, but also puts focus on the island’s local food scene. Orient & Maho Beach: If you’re going to visit St Maarten’s two most famous beaches, be sure to choose a tour that includes cold beer and delicious rum punch along the way. This fun tour does and is only $40! Topper Rhum Distillery Tour: After touring this famed distillery, you visit the tasting bar for unlimited rum samples and even the opportunity to bottle your own rum! The above-listed shore excursions are only a few of the vast variety of excursions Viator has available on their tour booking site. You can find these boozy shore excursions all over the world, from a whale watching & brewery tour in Alaska to a vineyard excursion in Northern Italy. Search Viator excursions for your ports of call. At some point during your cruise, go to the duty-free liquor store onboard and buy a bottle. This tax-free liquor is well-priced and you may even catch an additional sale on alcohol from time to time. Unfortunately, the duty-free shop will not allow you to take those bottles back to your cabin …that is, until the last night. On the final afternoon of your cruise, any bottles that you purchased will be delivered directly to your stateroom. Also on the final evening of the cruise, the duty-free store will, in fact, allow you to walk out of the shop with any liquor you purchase. On one cruise, we noticed that an entire liter bottle of vodka at the duty-free shop was actually priced less than two shots of the exact same vodka if you were to purchase it at the bar. Additionally, any alcohol purchased while in port will also be delivered to your stateroom on the final day of your cruise. So don’t hesitate to buy that delicious Jamaican rum or snag that bottle of tequila while docked in Cozumel. When you return to the cruise ship, you can easily check the bottle with security. Then once the last night of your cruise rolls around, any bottles that you’ve purchased ashore will be delivered to your room. Also, if you happen to be in port on the final day of a cruise itinerary, most cruise ships will actually permit you to bring any liquor purchases right back on board with you. No sneaky tactics are required. Just walk right on and put that bottle through the x-ray machine. But again, this tends to only be allowed when bringing liquor back aboard a cruise that has a port call on the final day of a cruise itinerary. The previous cruise alcohol tip is great for a cheap bottle on the last cruise night. But what about the rest of the cruise? Most cruise lines offer standard 750-ml bottles of liquor that they’ll send to your room. They’ll kindly set it all up nicely with glasses and ice for you to use throughout your cruise. Sometimes, they’ll even through in some free mixers too! The price of these liquor bottles with set-up ranges around $40-$60, depending on the cruise line and your liquor preference. While $50 for a bottle of liquor is much more than you’d pay for it at your local liquor store, the cost still comes out to being much less expensive than you would pay for several drinks at the bar on a cruise. On our latest cruise aboard the Holland America Koningsdam, the cruise offered a Gin & Tonic package that includes a bottle of Bombay gin and three cans of tonic water for $46.25 + 15% service charge for a grand total of $53.19. That $53 will yield at least 16 delicious gin & tonics that can be made and enjoyed right from the comfort of the stateroom throughout the entire cruise. This comes out to about $3.31 per drink. Meanwhile at the Koningsdam’s bars, that same Bombay gin and tonic comes to $8.34, after the 15% service fee. So it would cost over $133 at the bar for those 16 gin & tonics. Buying the bottle set-up for your stateroom ultimately results in a massive $80 savings. Best of all, this bottle set-up is a totally legal and acceptable way to have booze in your stateroom without having to sneak it on the ship! And with bottles starting at $40, it’s still semi-affordable too. If you’re a heavy cocktail drinker, it can really make financial sense to purchase a bottle for your room and then supplement with the occasional drink at the bar. Additionally, most cruise lines, aside from Carnival and NCL, do permit you to bring your own soda on board. So if you plan ahead, you can buy a $40 of liquor on the ship and then use your own mixers that you’ve brought. There’s certainly no need to tap into the expensive minibar sodas. Most cruise lines actually permit you to bring your own wine and champagne aboard the cruise ship. Usually, the wine allowance is one 750 ml bottles per person or two 750 ml bottles per stateroom. This wine that you can legally bring aboard the cruise must be placed in your carry-on luggage only and is only limited to bringing on embarkation day. Each cruise line’s wine allowance policy is slightly different. So we outlined the alcohol policies of the most popular cruise lines below. As these beverage policies do change, be sure to check the up-to-date policy directly with the cruise line, which we’ve linked to in the chart. If you’re really trying to get the most bang for your buck, bring some strong wine on your cruise. Many popular wines have a lower alcohol percentage of 11%-12%. For example, one of our favorite wines, Pinot Grigio, tends to have an alcohol content of about 11.5%, which is fairly low for a wine. Champagnes and sparkling wines often aren’t much higher. Those are traditionally great to sip while cruising, but they would be a bad choice to bring on a cruise if you’re trying to get your money’s worth in the few bottles of wine that you’re legally allowed to bring aboard the cruise. Shiraz or Zinfandel wine would be a better option for wine to bring on a cruise, as they are stronger wines, clocking in around 15% alcohol. Better yet, consider a dessert wine like port wine or sherry, each of which can run as high as about 20% alcohol by volume! If you’re trying to drink cheap on a cruise, bringing these stronger wines will certainly help to stretch that precious alcohol further. You will be charged a corkage fee if pouring the wine you brought in the main dining room. These corkage fees vary by cruise line but typically range between $15-$25 per bottle. Meanwhile, you can enjoy your own wine from your cabin at no charge whatsoever. Your stateroom attendant will happily deliver wine glasses to your room and will even deliver an ice bucket to chill champagne or white wine. But what if you want to have that glass of wine with your dinner without the expensive corkage fee? You can simply pour a glass of wine in your cabin and then enjoy it anywhere else on the ship. Usually, the wine glasses delivered to your room are the same glasses being used in the bars and dining room. As such, no one will know (or care) that you poured your own glass of wine. So fill up your wine glass in your cabin and then take it to dinner, thereby avoiding a corkage fee. Often the maître d’ will even carry your glass of wine for you as you’re walked to your table. Go ahead and make it a big pour. You may even be able to make one big glass last all the way until the dessert course. 💡 Pro Tip: How To Bring Beer Onboard a Cruise Too! If you’re beer drinkers like us, you may want to know how you can legally bring beer on a cruise instead of wine. A few cruise lines actually do permit you to bring your own beer onboard, although it is rare. Disney is one of the only major cruise lines that allow it in their official policy, permitting passengers to carry on six beers per person. Thanks, Mickey! For cruise lines that allow you to bring wine, you can instead consider bringing a 750 ml bottle of craft beer on board. Such bottles often have the appearance of wine or champagne. So that has worked for us to bring a nice beer instead of an allowed wine bottle. (See image to the right: the bottle on the left is beer). It has always been allowed for us, even though beer is technically against the official alcohol policy. Another way we get our own beer on a cruise is during port days. Bringing beer back onboard is almost never allowed officially, but we’ve found that security on many ships is willing to sometimes allow it in practice. To find out, we typically experiment with attempting to bring on a few cans during the first port day. We’re never sneaky and don’t attempt to hide the beer. Rather, we run it through the x-ray machine in plain sight. Sometimes the beer will be flagged by security and stored until the final night of the cruise. In that case, we know it’s probably not worth attempting to bring beer back aboard when in subsequent ports. But in many instances, security actually allows the beer to be carried on the cruise, no questions asked. For whatever reason, we’ve had much better luck with having our beer allowed when bringing on beer cans, rather than bottles. So go ahead and give it a try! The worst case outcome is that security will hold onto your beers for you until the final night of the cruise. And you can still drink those beers on the final night. So you really don’t have anything to lose by attempting to bring a few beers back aboard the ship with you. During our last Caribbean cruise, security was lenient enough to allow us to bring beer back onto the ship from every port we visited. 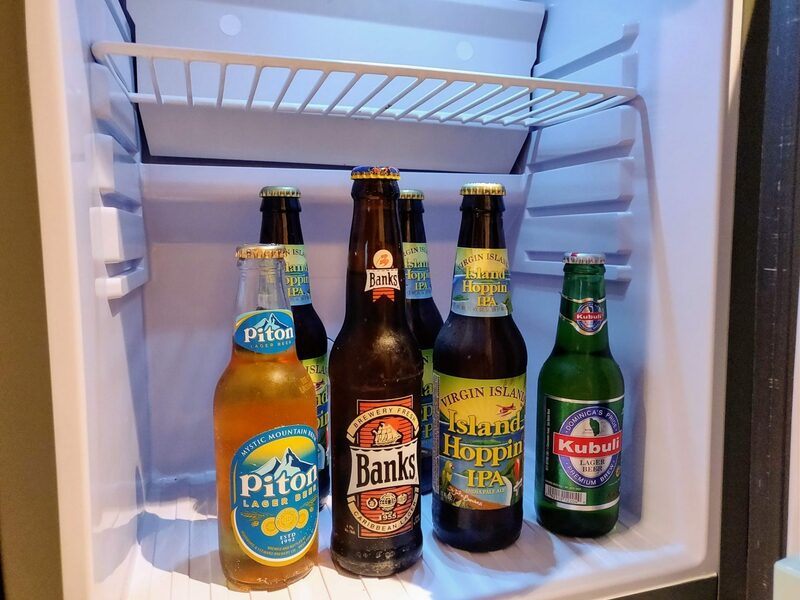 We gladly brought back our hauls to chill in our mini-fridge and hence have inexpensive local beers to enjoy on the cruise ship. Many cruise lines now offer all-you-can-drink packages. These unlimited drink packages can seem expensive on the surface, but all-you-care-to-drink packages can actually be fantastic value for those who tend to tip back a few while cruising. Unlimited beverage packages are a trend in the cruising industry that began about five years ago. Now Celebrity, Princess, Royal Caribbean, Holland America, most Norwegian ships, and many Carnival ships offer some sort of alcohol drink package. Each cruise drink package varies on exactly what alcohol included. But most of these unlimited cruise drink packages tend to be generous in their offerings, even including top shelf liquors. Some of the cruise drink packages further include specialty coffees, soft drinks, and other non-alcoholic drinks to help you recover the next day. Cruise beverage packages range in price from about $50-$100, per day, depending on the cruise line and the specific package. For example, Carnival currently promotes its CHEERS drink package for $51.95 per day + 15% gratuities. So for a 7-day Carnival cruise, such a package would add up to a total of $418.20. Again, this seems very pricey, but we’ll further show you how it may be worth it. All of the different cruise lines’ beverage packages differ in price. Here is a comparison with prices for some of the most popular cruise lines. The cruise drink package policies and prices do change, so be sure to confirm details before your cruise. 💡 Pro tip: Buy your beverage package online in advance. Most cruise lines offer a discounted rate, usually saving cruisers $5-$10 per day when the beverage package is purchased in advance. The prices listed above reflect the discounted beverage package rate. So buy online in advance of your cruise, or expect to pay a bit more if purchased once on the ship. Is the unlimited beverage package worth it? the price of the beverage package on the cruise you’re taking. For some cruisers, beverage packages can be totally worth it. For others, it’s not at all. Simply do the math. Take those considerations into account to determine if the cruise beverage package is worth it. This will depend on the price of the drinks and the package. Yet typically those who may drink at least 6 drinks or so each day, cruise beverage packages will likely save you. It’s also nice to not have to be concerned about your growing bar tab on a cruise. If you don’t think you’ll be drinking an average of six drinks per day, then usually the beverage package is not worth purchasing. If drinking more than that, definitely consider buying a beverage package for your cruise. These beverage packages can pay for themselves, even if you’re just having a few cocktails by the pool and a couple of glasses of wine with dinner. Six drinks in a day may seem excessive. But you’re in vacation mode, the many cruise bars are all-too-convenient, and there’s a party atmosphere. You may be surprised how quickly all those wonderful cruise drinks flow onto your onboard account. Drink packages can provide greater value on cruises with more sea days compared to cruises that are more port intensive. When you have many full days on the ship, you’ll have more opportunities and time to hit the bars. If you’re on an itinerary that calls on a port every day, with long hours, you’ll have less time at the ship’s bar to take advantage of a drink package. Yet if cruising is just one big party to you, the investment of a beverage package can pay dividends. Just drink responsibly and stay afloat! 💡 Pro tip: Get a Cruise Beverage Package Included for Free! Sometimes cruise lines will run special deals and offer these all you can drink packages for free as an incentive for you to book the cruise. That is how we drank for free when we sailed on the Norwegian Star. It was fantastic! It was open bar the entire cruise and nearly the entire drink menu was included, even most top-shelf brands! Also, there are a few cruise ships that are all-inclusive and even include unlimited alcohol. When we cruised on the Pullmantur Monarch, it included a full open bar during the two-week sailing. (Read our Pullmantur Review of a $159 Cruise). Additionally, the Norwegian Sky is the only ship in NCL’s fleet that also includes open bar for all passengers, which even extends to free drinks on their private island, Great Stirrup Cay! I’ve personally done the Bahamas sailing on the NCL Sky and it was one big awesome party for the entire cruise – so much fun! Search around to find cruise deals that include the unlimited beverage package. We tend to see such promos offered by Norwegian and Celebrity the most. Call a good travel agent who can let you know which cruise lines may be currently running such a beverage package promotion. Passengers have been known to sneak their own booze aboard cruises. We like to play by the rules and don’t particularly recommend this. But we’d be remiss not mention this as a strategy for cheap drinks on a cruise. There are often-tried cruise alcohol tricks like putting liquor in mouthwash containers and using green or blue food coloring in attempts to hide that it’s actually alcohol. Such tricks are well-known by security and you likely won’t be fooling anyone by pouring some blue colored vodka into a Listerine bottle. Plus, that vodka will probably end up with a faint minty taste that’s unavoidable. If you are going to smuggle some liquor aboard your next sailing, consider a cruise ship flask kit that is specifically made for the purpose of being undetected when going through security. These nonmetallic pouches are purposely designed to let no air bubbles when pouring liquor into the devices, making it undetectable. Many of these cruise flask kits have a good track record of success. For example, this Concealable and Reusable Cruise Flask Kit is currently the most popular alcohol smuggling device on Amazon and receives overwhelmingly positive reviews, with about 95%+ of reviewers indicating it got past security. Check the most recent reviews. So what happens if you get caught sneaking alcohol onto a cruise ship? The biggest consequence is embarrassment and potential confiscation of your booze. If you don’t buy a kit and do get caught sneaking booze onto the cruise, typically security will just remove the liquor and may even offer to hold it for you until the end of the cruise. If you’ve put a bottle of booze into your suitcase that security finds, the likely outcome is that they’ll hold it for you until the final night, although it does run the risk of being confiscated. If you took sneaky tactics like putting alcohol in a mouthwash bottle, security will almost certainly confiscate it. Many cruise lines’ official policies do indicate that passengers can actually be removed from the ship for bringing aboard your own booze. But that never actually happens in practice. Realistically, the biggest risk is having the booze confiscated. Well, that and your luggage not arriving to your cabin on Day 1 of the cruise and hence having to do the walk-of-shame to get the “issue” straightened out. Part of the fun of drinking on a cruise is the social element, hanging out the numerous bars, pubs, and clubs on these awesome ships. The nightly parties can be a blast. Drunken karaoke sessions are hilarious. Yet some of the aforementioned cruise tips for cheap drinks may confine passengers to drinking in their staterooms. That’s boring. You’re on a cruise – go out and have fun! So be sure to utilize those cruise happy hours, daily drink specials, tasting activities, and beverage package deals in order to truly make the most of your vacation, as you drink your way across the open seas! 🍾 Read: 8 Proven Methods to Get FREE Drinks on a Cruise. ⚠️ Never go on an international cruise without travel insurance. Avoid having to shell out for medical emergencies, flight issues, trip cancelation, or lost baggage by getting a quick quote from RoamRight, which we’ve found to offer the best coverage for the price during our cruises. More info here. 🏨 If you need a hotel before or after your cruise, be sure to book early. All the best hotels in port cities tend to get reserved by cruise passengers in advance. We like using hotelscombined.com to compare all the top hotel sites and score the best deal before it’s too late. 🚢 Check our huge list of cruise tips here: Top 50 Cruise Hacks to Save You Money, Hassle, WiFi and Weight Gain. 👍 Lastly, to receive our latest travel tips and inspiration, as we continue this journey around the world, join us and the thousands of other drink-loving travelers over on our Roaming Around the World Facebook Page. Every #ThirstyThursday, we post about what we’re drinking from wherever in the world we currently are. So check out where in the world we are this week and what’s on the drink menu! Do you want to save this article about Cheap Drinks on a Cruise Ship for later? Then be sure to bookmark this page or pin image to your right onto your travel Pinterest boards. Publishing note: This article with tips on How to Get Cheap Drinks on a Cruise Ship was first written in June 2014 and is continually updated, most recently in January 2019 with the latest information and prices. Just got back from a short 5 night on Majesty of the Seas. I bought the Deluxe Beverage Package and (as you list above) that includes drinks up to $12. However, I ordered many high end scotches which were 4 or 5 dollars over that as well as some specialty martinis for my wife (who didn’t have a beverage package…and often times at the same time) and wasn’t charged a dime. Is this just at the discretion of the particular ship we were on? Hmm, not sure. That’s kinda strange. But that’s great! Normally most beverage packages will require that passengers sharing a cabin all have a beverage package. So not sure how you may have gotten around that. But if so, sometimes the bartenders will be lenient with people on the beverage packages. The bartenders and drink servers earn a share of gratuities for serving drinks, whether you’re on a beverage package or not. So it’s in their financial interest to serve as many drinks as possible, in which case they may turn a blind eye to serving multiple drinks (and for other people), even though it’s technically against the rules of the beverage package. You benefit and so do they. That’s the only thing I can think of, unless there was otherwise some mistake or misunderstanding. Do you reckon we would be caught doing this? It may or may not work out. Really, it just depends on two things: (1) how lenient the staff is on that particular ship and (2) to the extent that you’ll be doing this. If it’s just discretely sliding a few drinks to friends here and there, you’ll likely be fine. But constantly doing it would be cumbersome and may raise suspicions. You’re only allowed to order one drink at a time. So it would be a pain to order a drink, give it to a friend, then wait a few minutes or go to a different bar to order another drink. Also ordering drinks during dinner could be problematic, as it would be very evident at the dinner table what you’re doing. hello My husband and i are going on our first cruise in Alaska, we are wanting to get a drink package and unsure which one to get the is standard, classic and premium. we both like our drinks beers wines spirits and cocktails and also like our premium coffees. my question is any suggestion to what package we get? I’m assuming you’re cruising with Celebrity, in which case the premium package will likely be the best bet. Celebrity’s premium beverage package is the only one that also includes specialty coffees. You’ll also be able to drink most all the top-shelf liquors, better wines, and craft beer. Of course, you’ll be paying a premium for this premium package. The classic includes still includes a decent assortment of cocktails and liquors, under $9, but no specialty coffees. The standard can be pretty restrictive since it keeps you $6, which can be difficult to do with the price of Celebrity’s drinks. So really it just depends on your budget and needs. But if you can afford it and think that you’ll drink a fair amount, the premium package would certainly be the way to go. Carnival’s CHEERS! progam also includes the premium coffees (and frappes, and spiked hot chocolate, milkshakes, etc) on ships that have the coffee shops on board. I am not a heavy drinker but consume a gallon+ of water,lemonade,tea daily,are there nonalchol drink packages? Are they worth it? In Chicago there are Tiki boat booze cruises on the lakefront,a friend Captians them on occasion. Best beach bar-BVI’S, just a lean to with a refrigerator,really cute girl bringing me beers,turns out she wasn’t working there but I was buying her beers too! So worth it and the look on my face when I found out later made everyone else howl with laughter. Good news: most all cruise ships have water, lemonade, iced tea, available for free around the clock. So no drink package needed for that. Sodas will cost extra and there are packages for that. But if you’re good with lemonade, tea, and water, then no need for the package. It’s almost always available in the cafe. They’ll serve water automatically in the dining rooms, but will have ice tea and sometimes lemonade too upon request. That’s funny about the beach bar story – lol!! Question: RE: NCL Escape NYC to Bermuda Oct 2018 … does anyone know if they still are offering 6 for 5 buckets of beer? Saw a 2017 comment that they don’t anymore, another after that they do. Nothing 2018 though. Looked on posted bar menus (not sure dates), don’t see any mention of buckets. Also saw a comment somewhere that there is a $5 deposit for bucket? True? And are there only particular bars on the ship where you can get them? If so which? I can’t confirm from first-hand experience whether or not the Escape still has beer buckets. But when we last sailed with NCL on the Bliss in April, I’m fairly certain they did on that ship, on the lido deck bars around the pool. I’d be surprised to learn if the Escape has done away with beer buckets, but it could be true. Will leave this comment up to see if there’s anyone who has been on the Escape recently may be able to confirm. Ok, just saw the “What It Was Like To Travel Entirely Around the World Without Flights” blog, so guess that answers my question 😀 Sorry, should have read more before asking. Than you for these amazing tips! who doesn’t love drinks right? especially when they’re cheap! I have never been on a cruise before but will use these hacks if I get to be on one anytime soon. There are other ways to get free drinks on ships that come to mind. There are art auctions on board most ships and wine is almost always offered. Find the bar and help yourself as they are free to enjoy. You don’t have to stay for the auction as the prices are generally inflated. Another way is the ship party to introduce the ships staff. One for early and one for late dining people. Why not go to both and get free drinks. Take a few with you. Also if you have sailed before on the ship ask about a party for past travelers. It is worth a try as the food is better and the drinks free. Have fun. this is an awesome cruise hack!will surely take note of this, I hope someday… I can use this…thank you so much! Our pleasure, so happy that you’ve found our cruise hacks to be helpful! Awesome! I will be having my first cruise ship with my hubby this September. There will be a lot of drinks that might be pricey however you can some cheap ones as well. Anyways, thank you so much for sharing this great tips. Fantastic! 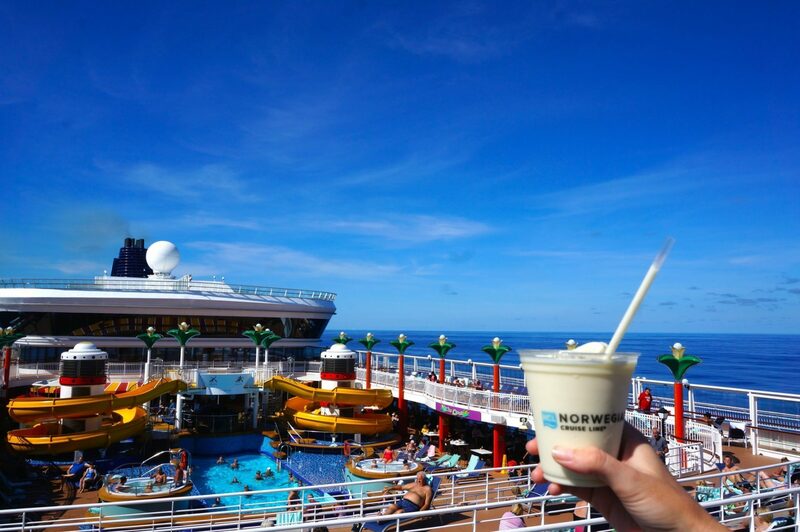 We hope you have a great first cruise full of inexpensive drinks! Just be careful… most people’s first cruise ends up being the first of many, hehe! Good information. My husband and I have been on a cruise and loved it. We definitely want to take our kids. I think I’d have to drink a lot to get $50 worth of alcohol consumed and at least try to get my moneys worth. I guess if some of them are high end drinks that cost a lot, I could do it with fewer drinks, but I can’t imagine drinking that fifty dollars worth of beer per day. It all depends how much you drink. For heavy drinkers it’s totally worth it, and then some. Other people, not worth it at all. The important thing is to do the math and figure out if it’s worth it for the amount you drink. $50 worth of beer may seem like an insane amount. But beers are usually around $6 on a cruise ship. So if you drank 8 beers in a day, that would make up the cost. Still even 8 beers in one day seems like a lot. But when you’re lounging by the pool, then have a few drinks during a long dinner, and then go hang out the at the bar later, it all can add up! So it all depends. The real treats are the little hidden gems where the waiter / bartender will actually strike up a conversation with you. Agree 100%! Give me a little hole-in-the-wall any day over any of those major chains. Senor Frogs seems to be in almost all the major cruise ports these days and they really aren’t too different from one another. We always prefer (and recommend) to check out the local flair of a port! The easiest way to get cheap drinks is to sail with a line that includes drinks in its fares. Seabourn Crusie Line, Silversea, Regent Seven Seas Cruises, Crystal and Viking Ocean are good places to start. Yes this is true. But those lines you’ve mentioned tend to be extremely expensive, so you are pretty much paying for those drinks with the high price of the cruise itself. I would absolutely love to go on any of those cruise lines though. Cruise aren’t for everyone but most people do really enjoy them. It’s funny, one of the biggest barriers to cruising is for people to actually take their first cruise. There’s a static in the cruise industry that is something like well over 90% of first-time cruisers say they want to return for another cruise. Cruising can be great! Don’t knock it, ’til you try it. 🙂 You should consider joining your brother-in-law and wife one day. Thank you so much! I thought that was strange,(told her dont care about free this and that, just give me the package) i told her im willing to pay for all of us, once in a lifetime trip, it was like she disproved of my request??! normally i would too! if it wasn’t vacation. just trying to do a nice thing for family and in-laws and really makes so much scene after reading your response and so appreciated. The ship is breakaway out of NJ/NY mid June, like i said, be happy to pay for package, she said NO to any alcohol package. they all end in April? Only during winter for incentives do they offer that?. Again it seems ridicules, but this is the case. i will call norw tell them as you suggested,the situation? agree? then i guess call travel agent, ask for owner, call there bull…poop and talk to her boss? sound like an OK course of action? TY also started this 11-12 months ago, looks like im paying same price(according to present pricing) as if i started a week before departure. it was a lot of money for me and feel like i was wronged. you’ve had the best news in 11 months,it’s still possible for package and savings. Ty Bill i am grateful your time and advice! Wow, this sounds wrong! I know this post is a bit old (last year), but I recently booked NCL NYC to Bermuda for October, 2018, and I definitely have this option (and many more.) However, a few things to note: It’s not necessarily just those in your cabin that must also get the drink package … my understanding is: if the travel agent booked your entire GROUP together, then ALL in the group must get the package … want or not. Children must get the soda package, adults the drinking package. The math just doesn’t work. I can get MORE alcohol for less by NOT getting the plan. I also checked the corks and Caps package … might be closer to working since that actually includes some juices, which my wife DOES drink a lot. I have to look closer … this one is harder since I/we also want our mixed drinks. But, I’m thinking even that doesn’t work for us. John: THANK YOU BOTH so much for these posts!!! They are SO very helpful. I actually figured out the advantage of buying by the bottle 2 min before reading this blog, but you gave me even more to think about! AWESOME!! I most definitely is! That’s one of the reason we like cruising so much. Many people view it as a luxury experience that is out of reach. It can be, but with the right planning, it can also be a very affordable way to see many different places. Wow! Alcohol for under $6 a person? That’s impressive! Taste-tasting events seem so fun. These are all excellent, informative tips! It’s always nice to find drinks under $6 and it’s absolutely possible, particularly with happy hours! 🙂 And those tasting events can be so much fun! Glad you found these tips informative – cheers! Spot on advice about not buying wine by the glass. It’s never a good deal. Yup, never a good deal unless you’re literally only planning to have one glass during the entire cruise …and who would do that, lol! We always recommend buying by the bottle if not an entire wine package. 🙂 Cheers! Awesome advice! I’m a cruise writer and I appreciate the research and dedication you put into this article. Well done! Very nice article on Getting Cheap Drinks. Surely this would help voyagers like me. Yup! We’re always looking for ways to cut costs on our drinking budget! Always glad to help likeminded travelers! Thanks for the tips about how to get cheap drinks on a cruise ship! I think that these tips could apply to anyone wanting to get cheap drinks. Especially, your tip about happy hour. Most restaurants have happy hour and their drinks are cheap during that time. Yup, happy hour can always be a nice bargain, whether on a cruise ship or in a restaurant. We love happy hours! this is how we used to do it, when we went on a cruise, lots of fun and for sure saved on your wallet. If you are a wine aficionado – take a wine cruise to top wine producing countries like France, Spain and Italy. Oooh, that sounds like a fabulous idea! Spanish reds, French Chardonnay, Italian Pinot Grigio all right from the source! Cheers!